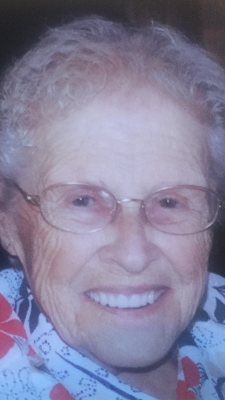 ELLENBURG-Hilda M. Lagasse, 92 of Ellenburg passed away Sunday May 1, 2016 at the CVPH Medical Center in Plattsburgh. She was born in July 20, 1923 in Ellenburg, the daughter of William and Ethel (Miller) Carter. Hilda was a devout Catholic and a member of the Altar Rosary Society for many years. She worked as an Avon Lady in Rochester, a seamstress in the Dress Factory in Malone, and in the school cafeteria in Ellenburg before she got married. She was a farmer's wife and the best mom, grandmother and great grandmother in the world. Survivors include, one son and daughter in law, Gary and Shirley Lagasse of Ellenburg Center, five daughters and sons in law, Joanne and Greg LaBarre of Ellenburg, Janet and Jack Dhaliwal of Ellenburg Center, Linda and Donald Decker of Ellenburg, Susan and David Smith of Plattsburgh and Karen and Rick Boutin of Mooers; two brothers, Floyd Carter and Leon and Rita Carter; two sisters, Luella Germain and Darlene and Dale LaBombard; two sisters in law, Betty Carter and Doritha Fisher and one brother, Lester Tourville. She is also survived by 15 grandchildren, 19 great grandchildren and one great-great grandson as well as several nieces and nephews. Hilda was predeceased by her husband, Raymond Lagasse, whome she married May 30, 1945, her parents; one grandson, Medric Boutin; two brothers, Edwin and Loyal Carter, one sister, Lenet King and several brothers and sisters in law. Hilda enjoyed cooking for her family and friends, sewing, listening to music and praying for others. Hilda was a beautiful soul who touched many lives while she was with us. For those who have known Hilda for years or only briefly, her presence left a lasting impression on her extended family at Breezy Acres in Ellenburg, the nurses and staff at Meadowbrook and CVPH, her neighbors in Ellenburg, the community and the members of St. Edmund's Church, she will always be remembered and she will be missed by many. At Hilda's request, calling hours will be private and held at the convenience of the family at the Ross Funeral Home. A Mass of Christian burial will be celebrated Wednesday, May 4, 2016 at 1:00 p.m. at St. Edmund's Church in Ellenburg. Entombment will follow at Whispering Maples Mausoleum in Ellenburg Depot. Donations in her memory may be made to the charity of one's choice.